Why would I publish my course materials in ebook form? Students are accessing their courses materials via mobile devices more often than through more traditional computers. Ebooks are formatted to function well on mobile devices. Many of our more traditional options for sharing materials with students just don’t work well with phones and tablets. What format should I publish to if I want my students to download course materials in ebook form? What would I put in an ebook for my course? It might also be a good idea to look for open source textbooks to borrow materials from. Try Open Stax, Open Textbook Library, or Community College Consortium for Open Educational Resources. You can’t sell your book if you’ve included chapters from open source books, and you might be limited on how public you can make it in some cases, but selling the book isn’t the point. What you need is a way to share material with your own students. As long as that is what you are doing, you can pick and choose chapters (or even individual lessons) from open source books to incorporate into your own lesson materials. How do I deliver my ebook to my students? The simplest answer to this is to upload the file into Canvas (or your LMS of choice), and make it available for students to download. If the book is more than a course packet, and you’ve really written your own book that you want to share with the world, you might look into pushing it out to Amazon and other vendor sites, but that’s not necessarily what our purpose is in getting started with the ebook format for the classroom. If you are using commercial ebooks through Vital Source or Course Smart, and your school already has a campus account set up for delivery, you might also be able to push your course packet out to the students’ bookshelves by uploading it into your Vital Source account. This is something you would need to get with your IT people and your company reps about. It’s an option, but it isn’t an essential option. The students can download your book into an ereader on a device if you just make the file available to them through your LMS. How do I make an ebook the free and simple way? Use programs you already know! Create your book using Microsoft Word, and then upload it into an ebook converter site. I recommend Liberio. This is a very simple tool. You just upload your book as a document, and download it in the ebook format(s) of your choice. If you are using a Mac, you will not even need an ebook converter. Just create your book in Pages, and export it directly from Pages as an epub. What if I want to work collaboratively with others on my ebook? There are a number of options out there, with varying degrees of cost involved. You could use something like Google Docs or Dropbox to collaborate, and then have one person run the document through an ebook converter when it is complete. 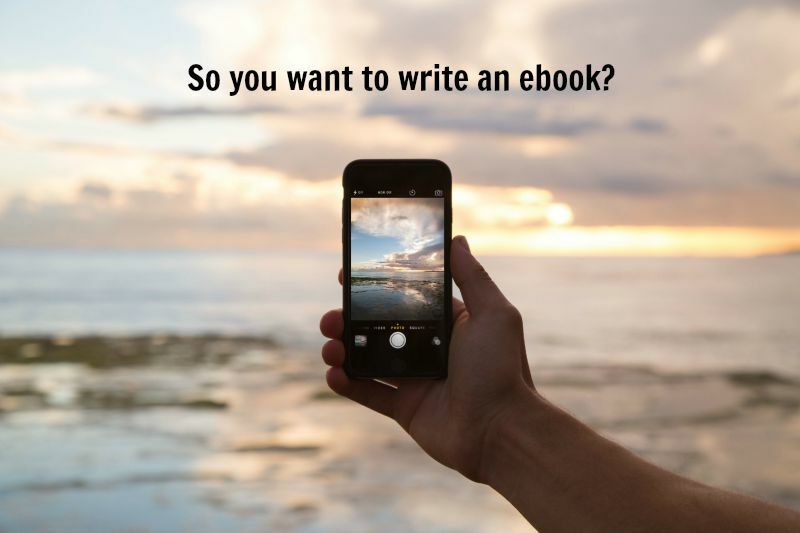 Or you could try one of the ebook authoring platforms that is available. My suggestion is Pressbooks. You can get started with Pressbooks for free (although there will be some expense if you want to publish a book without their logo on it, or if you want to publish multiple books, or books that go beyond the file size that you are allowed on the free plan). It is relatively easy to understand. It will allow you to have multiple authors on one book. It does allow for embedding media in addition to adding text. It also provides a variety of export options so that you can download in multiple format or transfer your book directly from Pressbooks to a vendor site like Amazon. It also will let your publish your book on Pressbooks, where it creates a nice online book, complete with slide buttons and a table of contents. Another option is Booktype. Booktype offers a free trial, so you can try it out before committing. After the trial period, there is a monthly fee. What if I want students to create their own books as projects? First, if you do want this to happen, I already know that I love you. Thanks for being my friend. Next, unless you want to have them create the books in Word and use an ebook converter from there, this a little more of a problem. Most ebook platform sites tend to limit the number of books you can create unless you want to pay a large amount of money. Students could all sign up for their own individual accounts on Pressbook or another site to create books, and that would probably work. There is another option, though, that might work if you have a good relationship with your IT people, and you are willing to bribe them with homemade cookies and cases of Mountain Dew. Both Pressbooks and Booktype have open source downloadable platforms that can be installed on your own self-hosted site. In that case, you don’t have membership fees to pay. You can download the software for free and use it on your own school server (or in some other hosted account). The open source version of Pressbooks works as a WordPress plugin (the two platforms are made by the same people), and it is recommended that it be added to fresh installation of WordPress MU. What if I just want to create an online book, and I don’t care about downloads? You might try using WordPress or some other blog/website creator to put together an online packet. You might also try a web authoring tool like Creativist. This is a site that makes online books and is really fun and easy to use. I made a little story about my dog using Creatavist just to try it out, and it was super easy. Like so many good things online, though, it’s free to get started with Creatavist, but you have to pay if you want to play too long or too often. There is another site that operates in a very similar way to Creatavist that is free to use, but it isn’t really intended to be used to create online books. It’s called Storify. This is intended to be a web curating tool, where you pull in things that you find online, and make a story from them. Storify creates a webpage that looks a lot like the kind of webpage Creatavist creates. It also allows you to add text. I haven’t tried writing my own story on Storify, but I believe that if I linked it to my own Flickr account and pulled in my own media instead of “found” media, that I could accomplish something very similar to a Creatavist story on Storify, and I could do it for free. Regardless, Storify is a great place to send students to work on projects. I’ve used it to have students do “pre-research” just to learn a little bit about their topics before working on library research. I also plan to use it to have students do some group presentations and other class activities. The photo shown above came from the site Unsplash and was edited in Picmonkey (to add the text to it and to resize it). I feel like that might be all I need to tell you about adding photographs to course materials. If you use these two sites as your go-to resources, you almost can’t go wrong. Unsplash provides gorgeous, high quality images for free. They are licensed under Creative Commons Zero, which means that you are free to use them however you want with no fears of copyright violations. Unsplash is the best thing that ever happened on the Internet. I see their photographs on websites and in advertisements and on book covers all the time. I just can’t even express how much I love them. I use their photographs on a regular basis in my Canvas course shells and in my classroom handouts. A great photograph can turn a blah set of instructions into something visually exciting, and sometimes that visual appeal is the little nudge that is needed to lure students in to reading the instructions. Picmonkey is also full of awesome. It is just a basic photo editor (with pretty and creative filters), but it is very easy to use, and it is free. There is a paid version of Picmonkey, but it is very affordable, and the free version does almost everything you might need. Most often I use Picmonkey to do just what I did with the photo above. I took a large file and resized it to something more suitable for sharing in a blog post, and I added my own text to the photo in order to use it to send across a message. 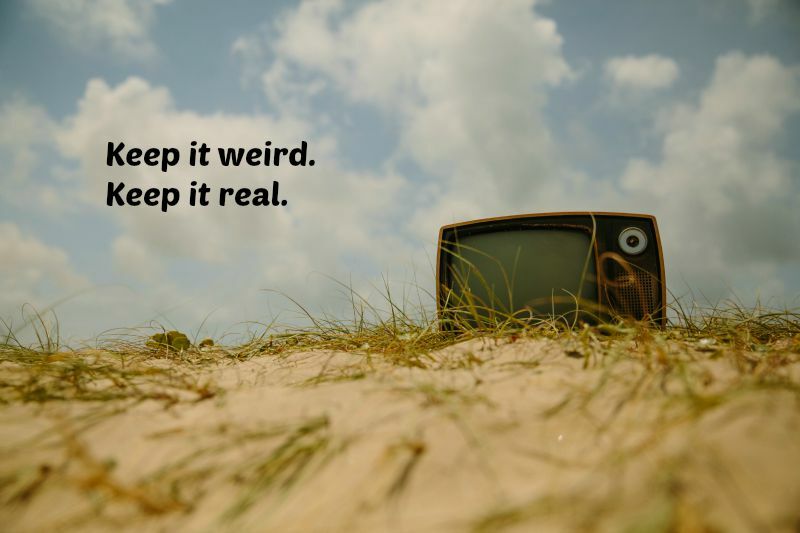 Keep it weird. Keep it real. That’s a good basic philosophy for making class materials engaging. Other sites of interest for accessing free-to-use photographs are Morguefile, rgbstock, and Flickr Creative Commons. It’s always better to assume that photographs we find online are copyrighted and should not be borrowed for our own purposes unless we are specifically told otherwise. These are just a few sites that do tell us when and how it is okay to download and use their images. There’s no reason we shouldn’t be borrowing the heck out of these images to bling out our courses. Click here for a link to an epub file on creating ebooks for the classroom. You can download the file and view it in an ebook app or through Google Play. The book is not in a highly polished form. It was put together for the purposes of giving ebook presentations, and it contains some deliberate flaws that were meant as talking points for the presentations. It also probably contains some unintentional typos because I am old and blind. 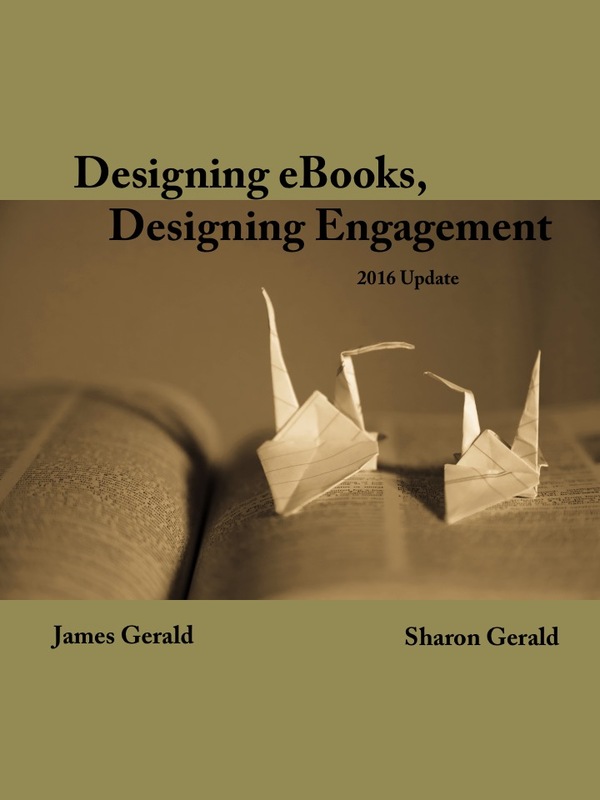 The epub was put together collaboratively by Sharon Gerald (me) and James Gerald (my brother). I love a good PDF. This is a sample of a PDF I made for a class assignment. I made it in Pages on the MacBook using a template that came with the computer. It is pretty. It has pizzazz. It was easy to create. What’s not to love? I will tell you what’s not to love. This is a document that I created with myself in mind. It fits the way I read online. It appeals to my sense of design. It is for someone who works and learns like I do: on a computer. Unfortunately, that model just doesn’t work for students anymore. They do most of their online browsing from their phones. I have always loved the PDF because of its fixed graphic format, but that’s the very reason that it is no longer the best format for classroom materials. Fixed formats are good for computers, but they are not good for phones. PDFs are just not that readable on phones. They might still look pretty, but they aren’t readable in any truly efficient manner. Move over PDF. The future of classroom handouts is ePub. We have to meet our students where they are, and that means we have to deliver material in formats they can easily access. For smartphones, that means ePub and other ebook formats. PDFs are still great for conference handouts and workplace documents meant to be shared with people who also work at computers all day, but they just aren’t what our students need anymore. No one hates to admit that more than I do. Rest in peace, my beautiful and long-lived relationship with the PDF for classroom purposes. I just ran across a blog that I set up in 2007 for a presentation at TYCA-SE. It refers to a presentation that I did in 2005 on blogging for TYCA-SE. I am now preparing to give a presentation called “Ten Years of Blogging” at TYCA-SE. This will be my third presentation on blogging for the same conference then. I didn’t remember that until I found the blog with the evidence, so I’ll just go ahead and add “a digital record of scholarly activities” to my list of things that a blog can be. My blog projects trail off in so many different directions at this point that it’s no surprise I can’t remember them all. I would be embarrassed by this fact if shame were not such a waste of time that could be spent in additional public self-reflection. I must say that working on this presentation has been an interesting look back at my own history. As the day of the presentation approaches, I expect to do a little more meta-blogging, and a little more linking back to my own previous blog posts and blog projects. Come on over and hang out while I do it. This will be like watching someone sort out ten years worth of vacation photos.